“Pay no attention to that man behind the curtain,” said the Wizard of Oz, as Dorothy and her band of misfits exposed his charade. 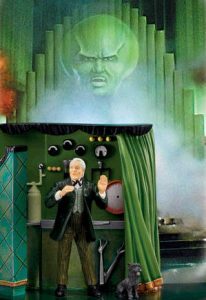 The Wizard of Oz exemplifies the false persona of the Narcissist. Narcissists were not born narcissists, but rather, were created as a result of childhood abuse, neglect or over-indulgence. The young Narcissist grows up believing that he/she is never good enough, is not lovable and feels intense shame and self-loathing. Because he did not receive the care and nurturing required to develop healthy attachments, his emotional maturity is permanently stunted and he deals with crisis in the same manner that a young child would react (with fear and helplessness and the adult version of tantrums – RAGE). He blames his caretakers for failing to insulate him from his own life (triggering an old wound from childhood where he felt unprotected). In order to survive these feelings of shame and inadequacy, the Narcissist goes to great lengths to hide his/her True Self from the rest of the world, believing that if he behaves in a manner opposite to his True Self, he will gain love and approval. Over time, the False Self hides the True Self from even the Narcissist. The Narcissist becomes possessed by a demon of his own creation. His ego. The Narcissist, having never experienced emotional intimacy, has no concept of how to be in a relationship (of any kind). He views all people as a threat to exposing him for the loathsome, unlovable person he feels he is. He keeps the True Self locked inside a dark cave, unable to grow and heal, while the False Self, the persona built entirely from lies, is the only entity the Narcissist allows to experience life, while the True Self dies a slow death. Intimacy is not possible with the False Self. Thus, ironically, the love and approval he has craved since birth is still denied him, and he resents the adoration that his False Self receives. Herein lies the difference between being narcissistic and being a Narcissist. All people behave egotistically from time to time. A moderate level of vanity is healthy. Nor does being self-centered, stingy or arrogant, alone, qualify as a Narcissist. The Narcissist lives in denial that his True Self exists. His entire life is a lie, just like the man behind the curtain. Because the Narcissist’s entire existence is a lie, he possesses no moral compass for truth. Lying makes him feel safe. While it is easy to feel pity for such a tortured soul, it is impossible to live with the Narcissist, without destroying your own sense of Self in the process. Because the people closest to the Narcissist will eventually see the mask slip, those people will become the people around whom the Narcissist feels most comfortable exposing his unlovable, loathsome persona to. And he will hate them for seeing it, and he feels in constant fear that those people will expose him to others. He works to tear down their self esteem to the level of his own, so that they will not feel superior to him. Adding to the unlikelihood of the Narcissist ever recovering from his mental illness, is his lack of Empathy. Because the Narcissist has emotionally detached from his True Self, he lacks the ability to feel Empathy for others. How can he relate to another person’s feelings when he cannot even relate to his own? He goes through life abusing the people closest to him with no understanding of why they protest his abuse or leave him. He is incapable of holding the False Self accountable because the False Self does not exist. When L. Frank Baum wrote The Wizard of Oz, he clearly patterned the characters after various disordered and co-dependent people he had encountered in real life. His depiction of a Narcissist is spot on accurate. If we want to see the Narcissist for who he/she really is, we must pay attention to that man behind the curtain and ignore the mask. He is exposed by his own duplicity.